Battlestations Pacific - WindowsBattlestations: Pacific is the sequel to the critically acclaimed Battlestations: Midway. The franchise returns with two massive single-player campaigns, the historically based US campaign and a historically possible Japanese campaign. Players will experience one war through two epic sagas to be a part of history or change it. Commanding the US Fleet, players relive the grandest and most critical naval battles of the Pacific War and for the first time, as the Japanese, players lead the IJN Fleet to a completely different ending to the war. No other game delivers the challenge of an RTS with the rush of real-time WWII flight and naval warfare. Players need intelligence and expertise to plan their moves in order to remain one step ahead of the opponent. The players command both strategy and action to anticipate every opponent move and turn the tide of war. Includes 28 major battles, 100 units including 21 new units, five new innovative multi-player modes across eight new multi-player maps, and many new features. 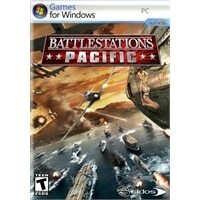 Battlestations: Pacific is the sequel to the critically acclaimed Battlestations: Midway. The franchise returns with two massive single-player campaigns, the historically based US campaign and a historically possible Japanese campaign. Players will experience one war through two epic sagas to be a part of history or change it. Commanding the US Fleet, players relive the grandest and most critical naval battles of the Pacific War and for the first time, as the Japanese, players lead the IJN Fleet to a completely different ending to the war. No other game delivers the challenge of an RTS with the rush of real-time WWII flight and naval warfare. Players need intelligence and expertise to plan their moves in order to remain one step ahead of the opponent. The players command both strategy and action to anticipate every opponent move and turn the tide of war. Includes 28 major battles, 100 units including 21 new units, five new innovative multi-player modes across eight new multi-player maps, and many new features.